Stampin' Up! Weekly Deals - Canada wide shipping! I hope you enjoy this week's Weekly Deals! Contact jenniferdimarco@ymail.com to order ! Don't forget about our 12 x 12 patterned paper on now - Buy 3 get 1 FREE ! Ends Thursday! 50% OFF Paper Pumpkin Special and Buy 3 get 1 FREE 12x12 Patterned Paper ! Offer Details: Use the code HALFOFF2 to join Paper Pumpkin before September 10, 2014, and get 50% off the first two months! After that, keep the creativity coming for only $24.95 + tax per month (shipping included). Do you want to see what's inside a Paper Pumpkin Box? Each month is something different! Get the word out to all your friends about the promotion this month. During the entire month of July, when you purchase three Designer Series Paper packs, you'll get one free. That's like getting $13.50 off your purchase AND receiving an extra--did we mention FREE?-- DSP! 12 x 12 Patterned Paper !!! *There is no limit to the number of free Designer Series Paper packs you can receive. For each three purchased, you (or your friend) will receive one free. I am excited to once again offer you my ribbon share! This year you will receive 1 yard of each of the colours. Take a look at the different ribbon types and happy shopping! 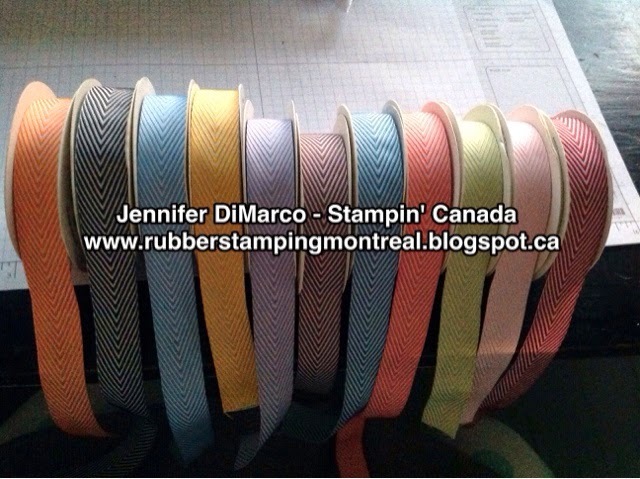 Pick up at my studio on Ile Perrot or shipping anywhere in Canada for $3 per ribbon share or $12 total shipping for all of the ribbon shares together. 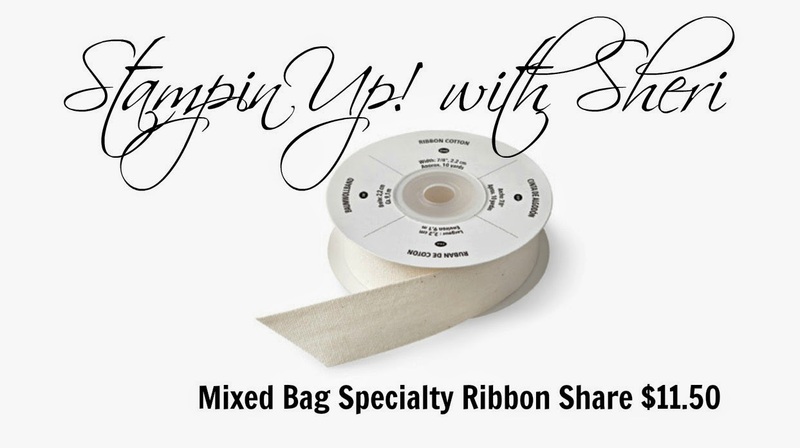 Joining a share is absolutely the best way to get a sample of all the ribbons in one bundle! You get the selection you want, without having to purchase full spools of each. Plus you aren't limited to one share, sign up for as many as you would like! As of July 25, I have a dozen shares in stock and ready for pick up or shipping! Once those are sold out, I will order more! What is a product share? It is a way for you to experience all of the ribbons without paying hundreds of $$ for them! How to order your share? 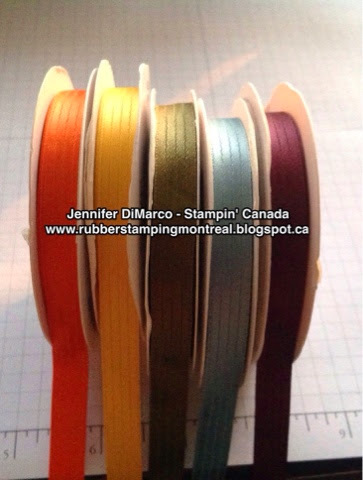 To order your Stampin' Canada Ribbon Share / Ribbon Sampler, please email me directly. Demonstrators are welcome. Please note this cannot be ordered as part of your Monthly Hostess Club order. Prices listed are the final price (includes taxes) unless shipping required. SHIPPING is available CANADA WIDE! All shares are protected by cello or ziploc bag to ensure safe and dry delivery! 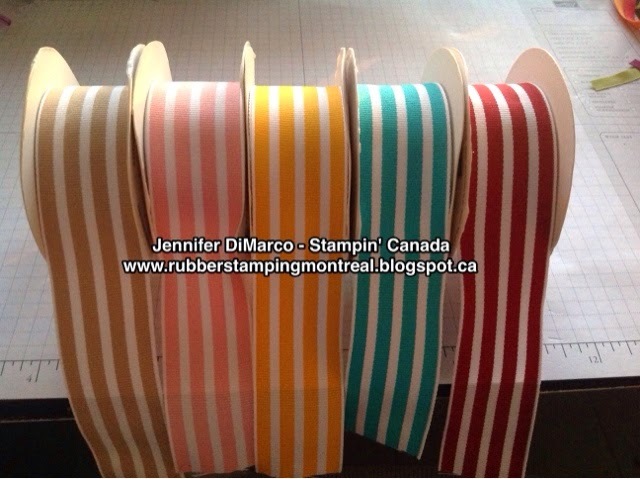 Wide striped grosgrain ribbon. Great for packaging! You will receive 1 yard of each of the 5 colours : Crumb Cake, Blushing Bride, Crushed Curry, Bermuda Bay and Cherry Cobbler. Similar to our traditional Baker’s Twine, but three times thicker! You will receive 1 yard of each of the 5 colours: Tangelo Twist, Hello Honey, Mossy Meadow, Lost Lagoon and Blackberry Bliss. Perfectly versatile ribbon in soft 100% cotton. You will receive 1 yard of each of the 12 colours: Island Indigo, Rich Razzleberry, Blushing Bride, Early Espresso, Whisper White, Pear Pizzaz, Pumpkin Pie, Melon Mambo, Daffodil Delight, Pool Party, Real Red and Marina Mist. Returning favourite now in even more colours! Soft and flowing - drapes like silk. Our most glamorous ribbon. Silky and luxurious. 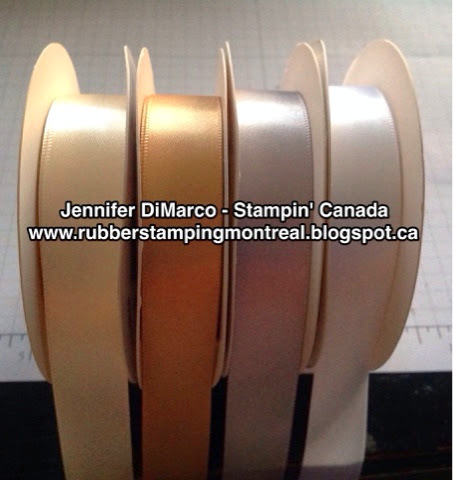 You will receive 1 yard of each of the 4 colours: Very vanilla, Gold, Silver and Whisper White. Cute and narrow with white trimmed edges. You will receive 1 yard of each of the 10 colours: Basic Black, Bermuda Bay, Crushed Curry, Melon Mambo, Old Olive, Real Red, Smoky Slate, Soft Sky, Gold and Silver. Trendy must-have! Adorable twill with chevron design. Whisper White accent woven through. Shipping is $3 per ribbon share or $12 for all ribbon shares. 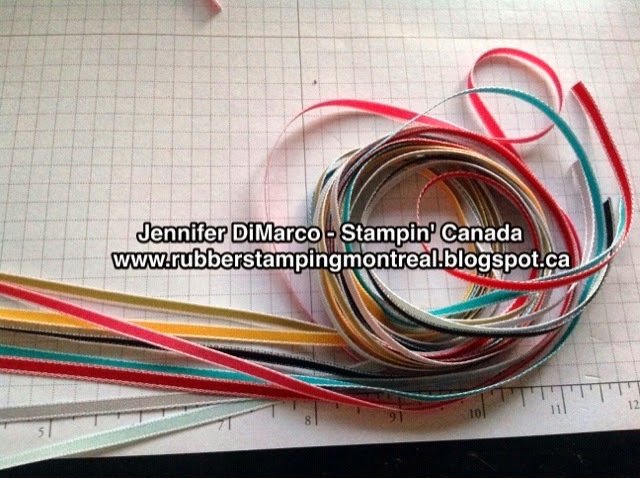 Labels: Canada, product share, ribbon sampler, Stampin' Up! Register for this fabulous event where you can relax and enjoy time stamping and scrapping in a fun and friendly atmosphere! Bring your projects with you and enjoy a full stamping weekend away – You deserve it! You won’t want to miss out on this fabulous weekend! Register soon – spaces are limited!! Early Bird Registration for this event is $130 if you register before August 15th and $150 if you register after August 15th , 2014. Note if you have attended ANY of my weekend retreats in the past you are entitled to a $15 DISCOUNT on your Registration FEE as my THANK YOU for your continued support and loyalty ! **As always Stampers Club Members and Creative Canadians Members receive additional gifts at the event! A non-refundable deposit of $30 is required upon registration with the remainder to be paid by September 30th , 2014. The Nav Centre fee is based on a 2 night stay at Nav Centre (to be paid separately at check in). - Raffles for fabulous Stampin' Up! Products – Bring $$ for tickets! 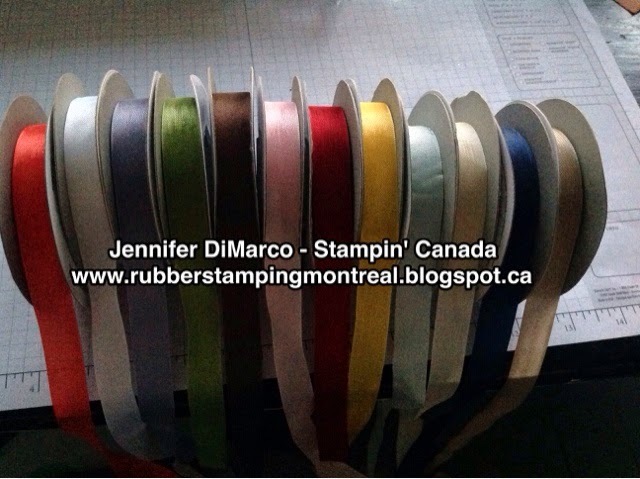 - Use of our Stampin' Up! inks, punches, stamps, Big Shots and dies!!! - Keurig Machine for your coffee, tea and hot chocolate favourites ! Hot water can be brewed also if you are a tea drinker ! - Access to the 25-metre lap pool and waterslide! - High-speed internet throughout the facility and access to computers! OPTIONAL AMENITIES at extra cost to you…. With a menu that changes daily, our main dining room serves a healthy variety of whole foods and freshly cooked meals. From convenient breakfast buffets to delicious lunch and dinner specials, our Executive Chef aims to satisfy even the most discriminating of palates. Along with several fresh daily specials, the main dining room offers homemade soups, sandwich and salad bars, pizza and a tempting selection of desserts. Please let me know of any food allergies at registration time. Breakfast: A full, hot buffet style breakfast is available at our Propeller Restaurant for $13.00 +13% HST per person per day. Lunch: A full, hot buffet style lunch is available at our Propeller Restaurant for $17.00 + 13% HST per person per day. Dinner: A full, hot buffet style dinner is available at our Propeller Restaurant for $21.00 + 13% HST per person per day. The Nav CENTRE is now home to unexpected luxury. Relax and rejuvenate at our full service spa by choosing a single massage, esthetic or salon treatment, or luxuriate with a complete package. The NAV SPA team of highly trained professionals will help you and your group look and feel your best. Our on-site bar offers guests the opportunity to relax, unwind and network. Stocked with a full selection of draft and bottled beers, wines, liqueurs, spirits and soft drinks, the Jet Set has something for every guest. With weekly live entertainment and a menu of bar snacks and appetizers, the pub is an ideal way to cap off a busy conference day. To satisfy between-meal cravings and provide the small items guests often forget to pack, Lift Off is open late. From Starbucks coffee and bakery treats to lottery tickets, newspapers and other sundries, Lift Off stocks the small items that will compliment your stay. To register for this event you can email or call your Stampin’ Up! Demonstrator - Jennifer DiMarco (514) 603-4594 jenniferdimarco@ymail.com . Only a $30 deposit is needed upon registration, and the remainder is to be paid on September 30th, 2014. Registration forms will be emailed to you once payment has been received. *Don't forget you need to let me know which room style (standard or junior suite) you have selected, who your roommates are (if applicable) and you will pay for it separately at check in. We have blocked off the rooms and suites, but you will need to select which room type you would like at the time of registration. Single, double or triple occupancy etc. Please note: meals are not included in room prices. If you cancel before September 10th , 2014 you are subject to 50% of the Nav Centre fee + $25 cancellation fee. Cancellations after September 10th , 2014 are subject to the full Nav Centre fee + $50 cancellation fee. Note: If you’d like to transfer the hotel portion to a friend or family member, please let me know so I can change the name on the registration before September 20th. Thank you for your understanding. Everyone deserves to be Spoiled Stampin’ Up! Style! Don't miss this fabulous opportunity to escape for some creative fun! Don't delay to register – we will fill up quickly! I am committed to creating a one of a kind experience for you! 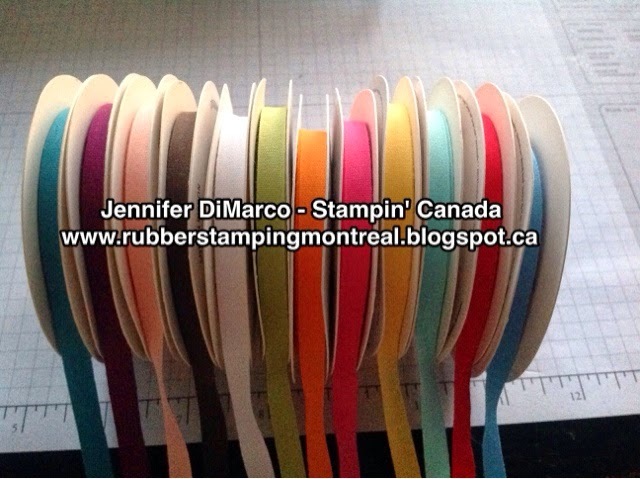 Looking forward to Spoiling YOU Stampin’ Up! Style!